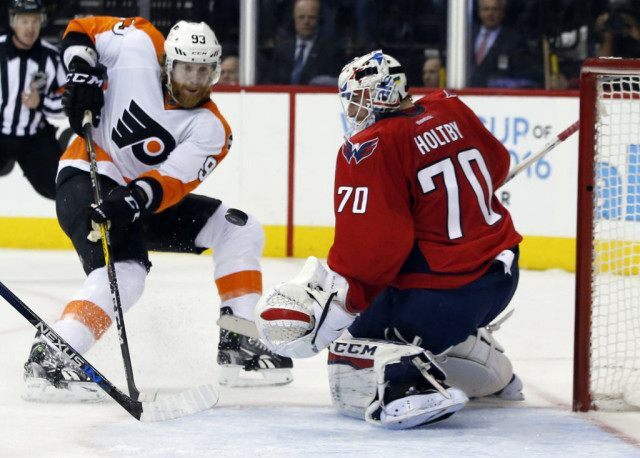 WASHINGTON (AP) — Washington’s Braden Holtby made 41 saves, Philadelphia’s Steve Mason gave up a goal from 101 feet away and Alex Ovechkin scored on the power play and the Capitals beat the Flyers 4-1 in Game 2 Saturday night to take a 2-0 series lead. Ovechkin’s 37th Stanley Cup playoff goal was as predictable as Jason Chimera’s goal from beyond the red line was unexpected. Mason whiffed at the puck on what turned out to be the game-winner. The Flyers outshot the Capitals 42-23 and dominated for much of the game, but came up empty as John Carlson scored his second power-play goal in as many games and Nicklas Backstrom added one at even strength late. Jake Voracek scored the Flyers’ only goal. The series shifts to Philadelphia for Game 3 on Monday night. Mason did the splits to stop Carlson from point-blank range early in the second period and was slow to get up. He remained in the game, but less than a minute later made the mistake that will be shown on bad-goal blooper reels for decades. After Karl Alzner backhanded the puck from his goal line, Chimera tipped it from the Capitals’ side of the red line. It slid five-hole on Mason, who wrenched his head back in dismay. The goal 2:26 into the second led to derisive “Ma-son” chants as the Flyers looked noticeably deflated. Voracek’s goal at 9:37 cut the Capitals’ lead to 2-1 and served to show that Holtby is indeed human after he stopped the first 44 shots in the series. Ovechkin was throwing his body around like few NHL superstars of his caliber can. He drilled Michael Raffl in the first minute and later dumped Braden Schenn into the Flyers’ bench. Back in the crease, Holtby picked up where he left off after shutting out the Flyers in Game 1 Thursday. The NHL’s all-time playoff save percentage leader made 19 saves in the first period, the same amount he had in the entire opener. The Capitals didn’t have much going for themselves until Evgeny Kuznetsov drew a holding-the-stick penalty on Brandon Manning. Carlson used a screen to beat Holtby from the point on the power play 14:09 in to make it 1-0. After Voracek’s goal, Holtby went back to his usual dominance, turning away Schenn on a 4-on-3 Flyers power play and then stopping Claude Giroux as it expired. Then, Ovechkin made Philadelphia pay for Mark Streit’s holding penalty. Ovechkin was wide open with nothing but ice around him when Backstrom passed the puck through teammate T.J. Oshie’s legs to the Capitals’ captain for his trademark one-timer on the power play. It was his first point of the series. The Capitals improved to 3 for 8 on the power play in the series after going 3 for 28 in the 2015 playoffs. The Flyers are 0 for 7 on the power play through two games. Holtby kept making highlight-reel saves, robbing rookie Shayne Gostisbehere with his glove in the third period before Backstrom scored the insurance goal with 2:13 left. NOTES: F Scott Laughton entered the Flyers’ lineup in place of Sean Couturier, out for the series with an apparent left shoulder injury. … Carlson became the first Capitals defenseman with power-play goals in consecutive playoff games since Al Iafrate in 1993. … With 71 playoff points, Ovechkin is one shy of tying Dale Hunter for first on the franchise’s career list.